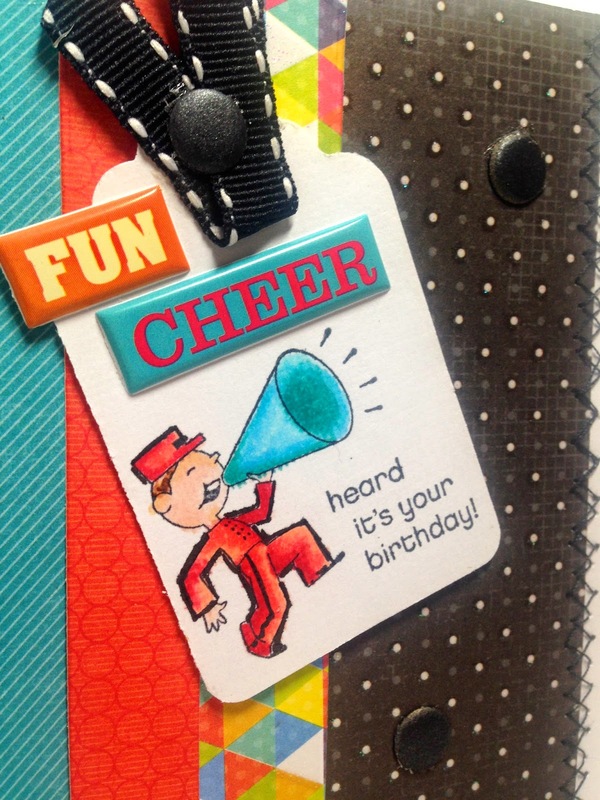 Amy's Creative Pursuits: Fun Cheers! Hello! First of all, thanks for all the comments and support I received about doing a second fashion post each week. It seems a lot of you really want to see repeat outfits worn different ways. I really loved Gina's comment 'We all don't get a new outfit 5x a week.'. So true. I've often wondered how some fashion bloggers afford to constantly buy new clothes all the time. I know a lot of them sell their clothes on their blogs, so maybe that's how they manage. I don't know. Anyway, enough about clothes, today's post is a paper crafting post. I made this card for a man in our church who I had no idea what his interests were, so even though it's slightly juvenile, I think it works for a guy because of the main image and dark papers. The image is retired SU! 'Ain't Love Grand'. The sentiments are epoxy stickers by K & Co., and the paper is DCWV 'Dots, Stripes, and Plaids'. Because the images in this set are so small, I stamped it on a tag I cut with a Spellbinder's Nestability Die. I also cut out banners using MFT dies to help take up more space on the card. I find little images so hard to work with, don't you? The image was colored with Copic Markers, and, as always, the red ink bled a bit so I went back with a black marker to do a heavy outline and conceal the bleeding. I really don't like red markers. LOL! Red and pink are the hardest colors for me to work with. For even more interest, I finish the card with a zig zag stitch and black paper dots. I'm sure I got this sketch from somewhere, but I didn't write it down and unfortunately I don't remember. If you recognize it, let me know, and I'll edit my post. 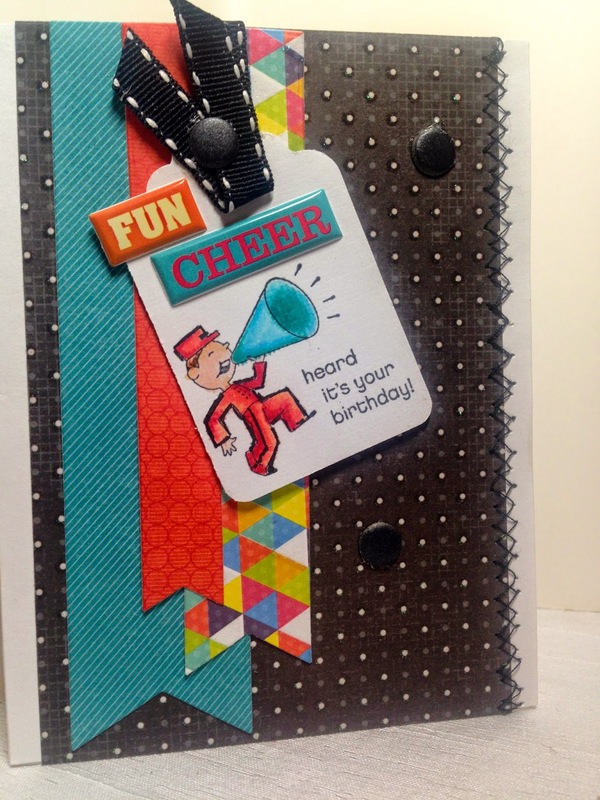 Fun birthday card, I love the colors and cute image. Great idea to add another outline to cover up the bleeding. I thought it as part of the image and it looks fantastic! Thank you Amy for visiting my blog and for your nice compliment. This craft is so cute and you are so thoughtful to think of a man at your church and to give this to him, I am sure this made his day. Amy, this is such an adorable birthday card!! Perfect color choices and great for a masculine design too! :) Happy weekend!